You have to credit Suzuki with being one of the first Japanese manufacturers to jump into the Adventure Touring category here in the United States with both feet when it introduced the V-Strom 1000 and its little brother, the V-Strom 650 in the early 2000s. Although both bikes had a face only a mother could love, just one ride could produce an affinity that would continue to grow over time. Indeed, it is hard to argue that the original V-Strom 650 isn’t one of the most fun, versatile and practical motorcycles we have ever tested. When it was redesigned for the 2012 model year, we reported on the significant changes. We have finally tested the revised model, but before reporting our findings, let’s talk about some of those changes. The new styling is obvious, and certainly an improvement in our opinion (hard not to be, perhaps). The standard seat is entirely new and taller (roughly 1/2 an inch), but the bike is a bit narrower at the knees thanks to a slightly smaller fuel tank (now holding 5.3 gallons). As a result, the reach to the ground is easier than most competing Adventure models we have tested. The new side cowlings are claimed to improve air management, from both a cooling and rider protection standpoint. The front fender is a new shape, which purportedly improves air flow to the radiator. Finally, the rear luggage rack is lighter and incorporates passenger grab handles. Handy rear preload adjustment knob. The 90 degree v-twin engine still displaces 645cc, but features revised cam profiles to improve low-to-mid power. Single valve springs replace double springs, reducing mechanical losses. The crank shaft and primary gear were redesigned, reducing mechanical noise and roughness. Suzuki also claims the bike is easier to start in cold weather. A liquid cooled oil cooler helps stabilize oil temperatures, and the clutch release mechanism is now a cam type. The clutch cover is thicker to reduce mechanical noise. The engine breathes through a redesigned muffler, and all of these changes contribute to equal, or better horsepower and torque throughout the rev range, while offering a claimed 10% increase in fuel economy. 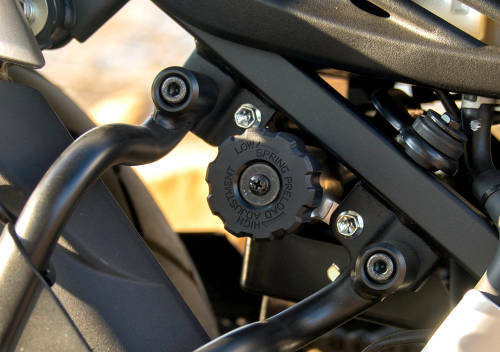 Braking includes a lighter, more sophisticated ABS system, while suspension continues to include spring preload adjustment in the fork with preload adjustment in the shock (via a convenient hand-operated knob – see picture), along with rebound adjustment. The wheels continue to be 17″ rear and 19″ front. An entirely new instrument cluster has new functions, including a gear position indicator, ambient temperature and fuel consumption meter. 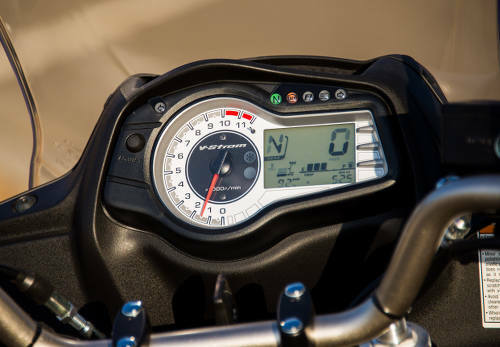 By holding down the meter select button, located on the left handlebar, for approximately one second, you can switch the LCD display to show either the clock or the thermometer. One of the strong-suits of both V-Strom models has been their dual H-4 bulb headlight system. The dual low beams and the dual high beams match the output of many automobiles and are very welcome when traveling at higher speeds at night. Fortunately, Suzuki chose to keep this headlight system in the new V-Strom 650. 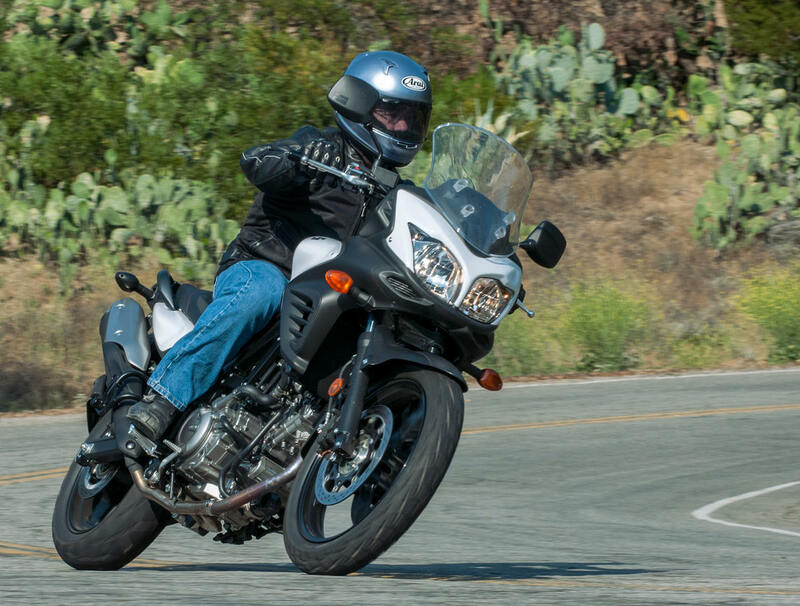 In riding the new V-Strom, we felt an improvement in suspension action. Damping seems more refined, and ride quality has improved, despite added firmness that reduced dive and pitch. Just as we had done with earlier V-Stroms, we ended up raising the forks approximately 10mm in the triple clamps to improve steering feel and precision. After doing so, we felt the same old nimble, yet stable handling that seemed to put a smile on our face every time we rode the bike. The stock Bridgestone Trail Wing tires offered good grip and comfort on the street, while still featuring large tread blocks for extra traction in off-road conditions. 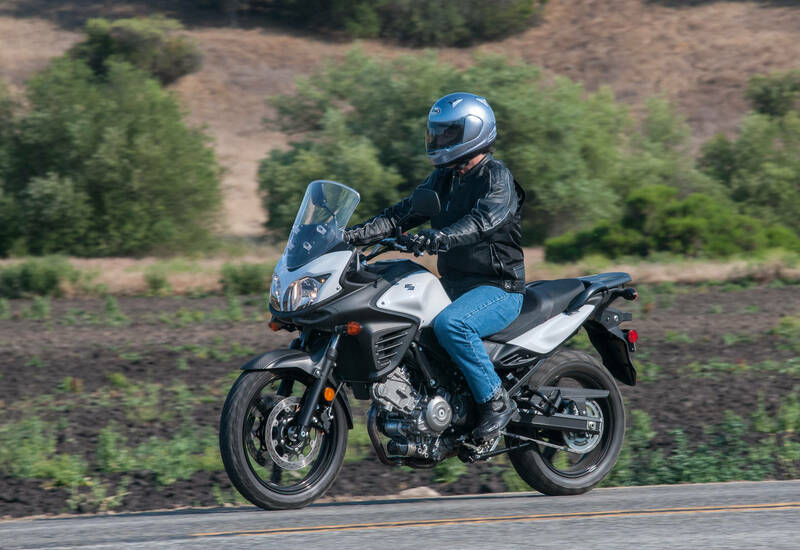 As a street bike, the V-Strom 650 offers excellent comfort from an upright seating position with good leg room, a much improved seat and a three-position adjustable windshield. Different test riders were able to dial in a windshield height that minimized buffeting at the helmet level. This is a big improvement over the prior model. 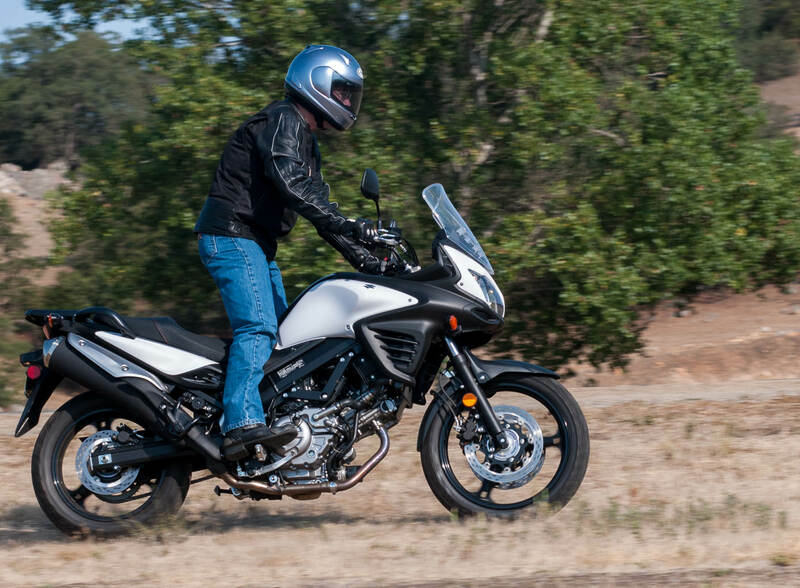 While the V-Strom 650 can handle light off-roading, it is still primarily a street bike. Don’t expect the stock tires to grab like full knobbies off-road. Added ground clearance and the 19″ front wheel do offer significant advantages when compared to most street bikes, however. The engine is largely the same jewel we discovered in the earlier model, with perhaps a bit stronger power delivery. The compact twin has a surprisingly broad spread of power and torque that allows you to short shift the bike, or rev it out . . . depending on your mood. Both methods will move you along smartly, and many Adventure bike enthusiasts have found the power more than adequate, and a worthwhile trade-off when compared to the more powerful, but often far less nimble, large-displacement Adventure bikes. The vibration felt from the twin is generally a pleasant sensation, not tiring, and the gear box shifts precisely and with low effort. Stricter emissions regulations may contribute to what we perceived as a slightly “less perfect” throttle response (from closed throttle to opened). The brakes continue to be adequate, if not stellar, and the ABS system was a welcome addition to a bike likely to be ridden long and hard. This V-twin has proven to be bullet proof, with many owners reporting well over 100,000 miles with only basic maintenance performed. The new instrument panel is legible and informative, but both speed and fuel mileage seem to be optimistic by a good margin (something other owners have reported). A simple clock readout would be a welcome addition, as well. So we have found the redesigned Suzuki V-Strom 650 to be a slightly refined and improved version of the original, but that has to be taken as a compliment. The original “Wee Strom” is a cult favorite for good reason. In many ways, it represents an almost perfect balance of performance and light weight. When you have a do-it-all bike that just happens to be loads of fun to ride, you have a winner. Suzuki already had that, and the new V-Strom 650 is even better in many respects. The 2013 Suzuki V-Strom 650 ABS is available in the following color options: Pearl Glacier White and Pearl Vigor Blue at an U.S. MSRP of $8,499. 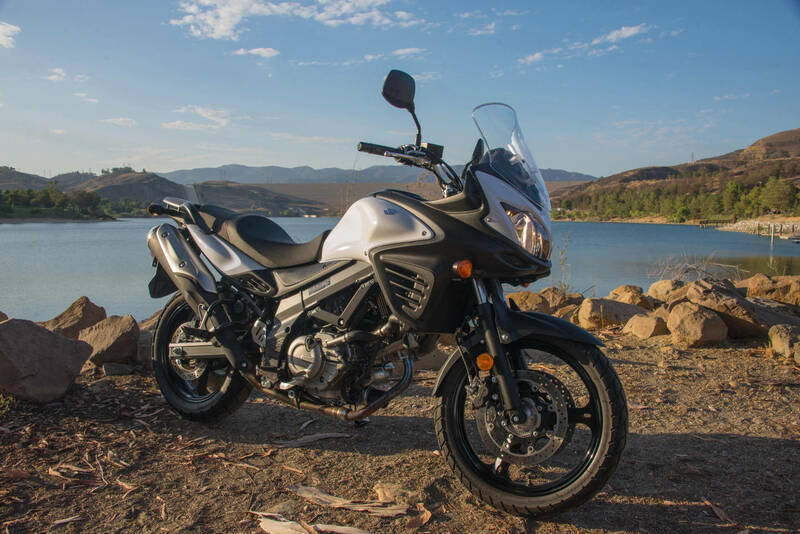 A separate, accessorized model, known as the V-Strom 650 ABS Adventure, is also available at a U.S. MSRP at $9,999 (featuring saddlebags, for instance). For additional details and specifications, take a look at Suzuki’s web site. I’m guessing there wasn’t a single 650 owner saying please remove .5 gal of gas from the tank. Range was adequate before, less so now, though obviously the 10% improvement in gas mileage could make for much of that. Having owned both the 1000 and 650 I settled on the 1000 based on the damping rod forks on the 650, cable clutch, and minor weight difference between the two (around 40 lbs.). However this looks pretty cool, however it appears that the cable clutch is still present (after having mine break on my 650 I swore them off! I’ve put 140K on a 1000, no replacement clutch, just brakes, oil and valve adjustments. The 650’s seem to have similar reliability. BTW your article says a “A simple clock readout would be a welcome addition, as well.” though it also mentions a clock readout earlier in the article. Is it not simple? Summary: Great bike, looks like crap. This was the runner up on my short list to the bike I bought. I would definitely recommend this bike to anyone looking for a good solid ride that they wouldn’t outgrow. From browsing through these comments it appears as though a majority of people buy this bike so they can say they have a Wee Strom. The sheer number of comments tells of the following of this great little bike. Had an O5 Wee and sold it to get a Triumph 1050 Tiger. Traded the Tiger in on a 2011 V Strom 650. Now waiting for the new 1000, so I can try it and see if I want both a Wee and a Vee in the stable. Love this bike! I have always wondered why Suzuki doesn’t use this engine on their Boulevard S40 instead of that crappy Savage engine. Seems like it would only make sense to put one of the best v-twin engines ever made on a cruiser. A guy at work bought an S40 and he was really unhappy with the bike after a 150 mile ride. He said he would never buy another Suzuki. Suzuki makes the S40 for first time buyers and many become last time buyers (of Suzuki bikes). That’s too bad because the S40 is a really nice looking bike. regardless how wonderful the SV/DL650 motor is it would not look right in the S40. The Savage (S40) has a very nice and simple looking engine. I have a feeling the guy at work was mislead; the S40 is more of a competitor to the Yamaha Virago 250, Honda Rebel and the H-D 883 in terms of size and performance. In that group it’s the winner. If he’s trying to keep up with bikes that have two or three times the power – forget it. i bought my ’08 in ’11 with 8500 miles on it. now it has 45000 and only needed tires, 1 chain and sprockets and oil changes. it has averaged 57mpg on regular gas. Yeah it’s no beauty queen, but the way it rides and handles is beautiful. Does anybody else wonder about the decision to locate an oil filter at the bottom front of the engine? Maybe it’s not (statistically) an issue. But it sure seems very exposed. Still an unattractive bike IMO…BUT…so is the Versys. I hear most owners of both of them really love em though!! That would make a good comparison article, Versus vs. V650 vs. Crosstour or something like that. Leave the BMWs and the Triumph middleweights out of the list though. If you look on the VStrom forums it’s not an issue. I haven’t heard anyone have a problem with an impact to the oil filter. I don’t even think I’ve seen a scratch on my 03 1000 (but it does have a plastic chin spoiler). If you are still concerned, all the aftermarket skid plates extend coverage to the oil filter. Its not an issue unless you’re like the guy who hit some crap on the freeway and knocked the filter off his 650. Rare but can’t deny the possiblity. Won’t happen to mine with a pretty good sized skid plate on it. You want to know how well-suited the V-Strom is to my type of riding? I’ve been riding the same ’02 DL1000 since early ’03, having bought it slightly used. Went through 3 bikes in 7 years before that. The riding position, including the amount of leg room, is just about perfect for me. I don’t know that I’d say I love it, it’s not exactly the type of bike to be passionate about, but it’s generally quite satisfying to use for general cruising around, touring, and even riding in a somewhat sporting manner. Its 90 RWHP is sufficient to give me the kicks I need, but not so much as to put my license in jeopardy, lol. The 650, of course, is very similar, but with less weight and a smoother-running engine, although less powerful. Overall just a very usable bike which is easy to live with. I even think it looks good from certain angles, although it is definitely awkward looking (if not downright ugly) from others. Oh, love the headlight setup, too, as mentioned in the article. Looking forward to see if the new DL1000 will hopefully be not quite as gaudy as the pictures that have been going around, lol. Great bike. Makes a fantastic light sport-tourer. I had one the year they came out, ’04. 6yrs and 40k flawless miles later I got bored with it and sold it for chump change. dumb move. I would certainly consider another. having owned close to a 100 motorcycles since 1971 and currently with 6. why does the Harley comparison seem to always appear? I just did my annual ride on deals gap on my new Kawi Concours and this guy who was riding some form of bagged harley parked next too me. he asked what size engine my bike was. I told him it was a 1400. he then tells me his is a 21__ something or the other and he would out run me. After five years with my 2008 WeeStrom, I got the itch to try a different bike. So I went on a few test rides, kicked some tires and decided to wash and wax my DL650 and keep it for a few more years. Nothing out there compares. Great write up on a truly magical motorcycle. Still kicking myself for selling my 06 V-strom. The best, most versatile all-around bike I’ve ever owned. Never gave me a moment’s trouble. Comfortable and fast enough. My ’06 naked-ized Wee is my favorite real-world just go-for-a-ride motorcycle that I’ve owned and I’ve had 70 or so machines of ALL types in the last 40+ years. (never married/no kids! )All the power you can really use on the street and it’s fun to be able to use it all, handles just great on real-world roads, comfort and plenty of gas on board. Pretty hard to beat, and certainly no uglier than a GS! And can go places they can’t. With LOTS of money left over to get there! Do you have a link to any photos of your bike? Only speaking for me. This and other bikes like are why I got into motorcycling in the first place. My earliest and fondest memories of the sport happened when I was 14, with my first real motorcycle, a 1972 Yamaha 175 CT-1, My Dad surprised me with it in our living room next to the Christmas tree, along with a Yamaha JT-80 Mini Enduro for my 9 year old brother. That feeling of freedom and responsibility for my own destiny in the woods of western Pennsylvania stays with me to this day. It was a different time, and during those summers my parents didn’t know within 40 square miles where I might be. God Bless them for trusting me with that! Consequently, I’ve never outgrown the need for occasionally completely removing myself from society. Only a dual sport/ADV bike can provide that. These bikes are not about loud, leather, look-at-me, social motorcycling. They are about bad roads, often in questionable weather, in he middle of nowhere, BY YOURSELF introspection. I have a garage full of bikes; sports, standards and cruisers. But the one I’ll never part with? My 2005 XR650L. Why? Because I’m a motorcyclist, not a biker. Thanks for sharing your story. I just knew there had to be other guys out there that felt the same about motorcycling as I do. It’s not about who you impress or feel superior too while out on a bike. It’s about the ride. Not to pick nits but the statement, “…handling that seemed to put a smile on our face every time we rode the bike”, implies that the handling gave the appearance or sensation of putting a smile on your face without actually doing so. Also, what sort of motorcycle riding creatures are you that share a single face? I’m so confused. Somebody please call an English major. BTW, I love my V-Strom 650 and intend to take her as my bride if she’ll have me. Hmm lets see…68 hp 475 pounds $ 8000 vs maybe 68 hp ( they wont say) 842 pounds $20,000 plus… I know which one appeals more to me…and it doesnt look like a bright red Harley. Lets see a Kia Soul or a Ford F150. Gee they both have 4 wheels don’t they? If that was to me i really don’t understand what that means. Yes they both have 4 wheels. If a Kia Soul and a Ford 150 both had the same horsepower, I imagine the Kia soul would be a lot for fun to drive since it weighs a lot less. Let me explain it to you then, comparing a HD and a wee strom is about as apple and orange as you can get. I have both and comparing an inexpensive bargain bike (and when you look at its build and finish quality and quality of components you can see it) to a premium priced cruiser is a pretty silly thing. One might also consider its not all about hp, we talk about hp but we ride torque. They both have 2 wheels don’t they? They are both motorcycles. There are attributes of both that can be compared. Weight, horsepower, and price are tangibles that can be compared. One is X the other is Y. It’s not that difficult. We all make decisions based on these variables for our purchases. It’s easy for me to say I’d rather have a motorcycle that weighs 450 pounds, has 68 horsepower and costs $8000, compared to one that weighs 800 pounds has 68 horsepower and cost $20,000. easy decision for me. It’s the intangibles that are hard to compare, style, intended purpose, color, etc. Like horsepower, if there is enough torque to move motorcycle,passengers and gear along at desired speed, excess torque is as useless as excess horsepower. Oh we ride torque do we? Interesting. No doubt your harley will out run the Vstrom right? Yes – Great bike! I have one. It is everything I wanted in a street bike, but a bit on the boring side. Great range, and mileage, sit-up comfort, and reliability. It even looks pretty nice. But if you want to snap up a wheelie every now and then, well, this is not your machine. I am going to keep this one for a while. As mentioned – The left side “trigger” toggles the display between temp., and clock. Indian announces a new v-twin motorcycle and the fans here dismiss it as “just another v-twin” and wish that Indian had built something, you know, interesting. Suzuki makes minor updates to a buzzy v-twin mounted in an ugly motorcycle and the crowd loves it. I guess ther are some people who value how a motorcycle performs over how it looks. Go figure. That’s why there’s Fords and that’s why there’s Chevys….. This little “buzzy” v-twin is smooth as glass and will leave that Indian in a cloud of dust. Once you get past their dorky looks they’re really great bikes to ride. The dorky looks helps keep people who normally steal shiney cruisers away. You can’t see how dorky it looks when you’re riding it. While I’d like to ride something that other people admire, for the most part I’m past caring much about what other people think. I care more about what miles and miles of road unfolding in front of me looks like, while riding a bike that I can stand to sit on for many hours to see more of those miles, while still having some sportiness for the twisty bits. I’m not as young as I used to be, though, and place more importance on comfort than style now. I unloaded a 18Wing last year and got a slightly used 2012 Wii. I put about 2 grand of accessories on it and rode it, from Dakota to Utah, in June. In one week, 4000 miles will tell all. My only whiney complaint is, my arse and saddle quarreled after more than 600+ mile days. That’s it, no other complaints. Mileage is usually 50-53 mpg, with easy range to 230-240 miles. We rode across the Great Plains at 85+mph, over Rocky Mountain passes at 10,000 foot and rode the White Rim Trail, by Moab. There aren’t many bikes that can do that. I love the looks of it because I know I can go where ever in the hell I want, have a blast doing it and not have to worry if I’m purdy enough. The 2013 650 V-Strom’s motor is dated and weak, but the Diversion 600’s motor has plenty of power in reserve. Did I get that right? You know that a) that V-Strom will probably beat the Diversion in TQ and HP, and that b) the Diversion motor is a tarted up 1982 Yamaha Seca 550 motor, right? Not that there’s anything wrong with that…the Seca 550 is one of the finest street bikes ever built IMO. one picture parked along the road, in dirt, and another riding through a flat field in 2″ grass, is this adventure? How about a Titus canyon picture? “However if Yam brought out an ADV version and sold it for $7990 then the Suzuki might be in trouble.” Not if but when and with more power, less weight, probably better suspension and not so ugly you have to sneak up on it when no one is looking. The FZ-09 will be worth waiting for. An ADV version of the FZ-09 would probably be closer to $9K. Just knowing that Yamaha could spring such a bike on us at any moment might make some people hesitant to buy the wee strom. It’s kind of like marrying a foxy chick with really fat parents. If this bike came to fruition, I am almost certainly an early adopter. I’ve never heard this FZ9GS idea floated before, but as soon as I read it above, I was sold. Me want. Not only that, but IMO if they simply ‘ported’ the FZ09 into an ADV bike, I think there’s a pretty good chance that it would be a _lot_ better a bike than the Super-T in pretty much every way. Maybe this will make the FZ09GS (I made that up) harder for Yamaha to make? A lot of people have suggested an adventure bike version of the FZ09. I hope Yamaha hears the suggestions. I’ve taken many long trips around the country on a Versys and have done several 700 plus mile days, and i always feel ready to go further. The seating position on bikes such as the Versys or the V Strom is pretty ideal, but a few more HP would be nice. A FZ09 version of the Super Tenere would be a great idea. Minor point, but regarding the reported lack of a clock – according to owners of the 2012 model which appears to have exactly the same display, the clock shares the same real estate as the temp readout, and you toggle the display between the two. Is it possible you didn’t try that in your review? Unfortunately, it appears that Suzuki is abandoning this very effective headlight system on their redesigned 2014 V-Strom 1000. Instead, they’re going with an even uglier single headlight and plastic beak (leading current V-Strom riders to refer to the new model “Vee” as the “VEEK”). No biggie since these bikes aren’t meant to be head-turners anyway, and we won’t be able to see the ugly from the cockpit. The concern is, while this new model will have a completely redesign 1000cc engine that might be closer to the smooth sweetness of it’s smaller 650cc counterpart, the styling change of the single headlight system of the new Veek could be a big letdown to those who have been spoiled by the current twin headlight system – which illuminates the road ore effectively than many cars I’ve owned. So can MD please specifically include a comparison of the old vs. new headlight system when they get their hands on 2014 V-Strom 1000? Purty please? This would have been even better. I can get my own windshield and luggage rack. Despite deserving scorn for starting the whole “beak” thing with the DR Big, Suzuki deserves credit for a really nice restyle of the Wee Strom. Much more attractive than the old one. To my eyes, this and the new KTM 1190 are the best styled ADV bikes and neither has a beak. In this class of ADV bikes which are mostly hideous, you’d think it would be easy to look good. I’m sure these are great bikes, I hope they come in some actual color other than boring silver/gray. I’m sure people actually take these off road, but the front exhaust pipe looks really vulnerable. I can see how people would like this bike because of the adventure touring thing. I just don’t know who is going to want the SFV650 for $7,999 when you can get the Yamaha FZ-09 for $7,990. Love the 650 V-Stroms, but you make a good point. I’m intrigued by the new FZ. You make a good point about the close pricing however Suzuki have made adjustments across the previous version of the Wee Strom that have apparently refined an already well proven model. If the FZ-09 evolves a variant with decent adventure touring specs it will also be very attractive. I agree as is I don’t think the two bikes would appeal to the same buyer. However if Yam brought out an ADV version and sold it for $7990 then the Suzuki might be in trouble. Yea, look what the V-twin lovers did for the SV1000’s. more like what 1200cc lovers did to the 1000. see entry for 12gs, multi12, VFR12, explorer12, tener12, etc. You’re right. Don’t underestimate the loyalty of V Twin people. I’ve never fully understood it, but I’ve known people who wouldn’t consider anything else. I currently have a V Twin cruiser, BlackCayman. While I appreciate the low RPM torque in around town riding, and like certain characteristics of that type motor, I still prefer a multi cylinder, multi valve engine both in terms of sound and smooth power delivery. It just goes to show different people have different tastes. I’ve had Singles, in line twins, a V Twin, a big Triumph Triple, an in line 4 sport bike, and now a 6 cylinder BMW touring bike. I didn’t think I’d ever find an engine I’d like as well as the Triumph triple, until I rode the in line 6 BMW. I wish more motorcyclists would be a little more open minded and try other things. I’m sure many would stay with the V Twin or in line 4’s or triples even if they tried other bikes, but V twin owners seem (in general) to be less open minded to trying other things. To me, variety is nice. Beautiful sound is in the eye of the beholder as well. I love the sound of an MV Agusta 4, probably more than any other motor, though my in line 6 BMW is a close second. I also love the sound of the V4 Aprillia motors. Most of my friends would take the big V Twin sound over anything else. I’m not a big fan of that sound myself, but do like the V Twin Aprillias and Ducati’s. Just not as much as I like the sound of high revving multi valve motors. That doesn’t mean I’m right and V twin fans are wrong, It just means we have different tastes. But the only way to know what you would like the best is to try as many as possible, then make the decision. I’ve spent a day on a Tiger 1050 and one on a Speed triple, I do like the character of the motor. I’m anxious to read reviews on the new Yamaha triple. Knowing Yamaha, they probably got it right the first time. Fz9 tank size: 3.7 gallons. V-Strom tank size: 5.3 gallons. Maybe someone who wants to ride some distance before finding a gas station. I’m sure this bike out-performs the new Indian in every measurable way; performance, comfort, reliability, economy… It’s a shame that those types of motorcycles are bought on image and styling alone. They never know what they’re missing out on. Apple and orange comparison! Besides this bike has probably 1/3 the torque of the new Indian at best, if speaking of performance. Anyway cruiser, adventure touring, sport, sport touring each has its own strength as well fans. I rode cruiser before, and been riding street bike as well as sport touring. Love them all. Torque doesn’t give you more performance if its less powerful – or even if its the same power with more weight. So, the Indian runs taller gearing, that reduces acceleration. Both bikes are designed for touring. One’s a Gala apple, the other’s a Granny Smith. Agreed. Even the Gold Wing is still a motorcycle, not a car, despite having many amenities of the latter! It may not be my cup of tea (i.e, it isn’t) but it’s still a damn bike! Indian? They’re not motorcycles, are they? They are relics, bark of history. Why do people constantly bring this kind of thing to discussions? I’m not a cruiser guy, but maybe it’s you who doesn’t’ know what you’re missing out on. Nobody buys a big cruiser for performance, so continually pointing out that a slower bike isn’t as fast as a faster bike is just silly. The bikes aren’t only about image and style (although that is a big part for many)…there is something to be said for not-in-a-hurry cruising and touring. Not only that, but when exactly did it become a crime to appreciate how “cool” a bike is. I happily admit that I get some enjoyment out of walking into the garage and seeing a bike there that I really just like. When I open the door, I don’t care what the dyno graph says…it’s just cool and I like it, and it makes me smile. As it happens that bike for me right now is a CBR1100XX all gussied up for touring, but I don’t like it because it’s fast, I like it, well…just because I like it. Isn’t that enough? Well then, if you like your CBR1100XX then you’d really love the new CBR500. A CBR500 is nothing like a Super Blackbird, except that they’re both Hondas. Finally someone says something that makes sense! Please refrain of constantly making comparison to or making jokes of (are they really?) American V-Twins. Most readers are not interested in this kind of discussion, and some comments are driven more by passion that knowledge. By the way, I own an ’06 V-Strom DL 650 and an ’08 H-D Electra Glide Ultra, and am happy with both. I never got the cruiser thing either, until I bought one as a third bike. There is something relaxing about them and i have to admit I’ve enjoyed it more than I thought I would. A cruiser could never be my primary bike though. Once you’ve ridden a smooth running bike with a high revving motor and modern suspension, it is hard to get that out of your mind. I recently bought the K1600GTL BMW with the 6 cylinder motor. Probably not a wise move as that motor has spoiled me for life. The power, smoothness and sound are incredible. Unfortunately the price is a little stupid. I will have to hold on to this one for a long while. Indian as a NAME has a time line going back to 1901. Suzuki has been producing motorcycles since 1952, ironically the year before Indian went out of business. Indian in production for 52 years..Suzuki in production for 61 years. I like the looks of this . Would I buy one maybe , I have ridden the older models and liked them. Certainly not beautiful, but an absolute gem of a little bike. Suzuki really hit a homer with this motor, in all it’s iterations. Much better than the Strom 1000, a sample of which I rode just the other day. Although a liter bike lover, between the two Suzukis, I’d take the wee every time. I kind of sit on the fence for some time, waiting and speculating. Having currently 900 and previously liter size bike I’d also prefer something little bigger, like 800. The appearance is bit of distraction. But, that camel-like appearance won’t go away – it’s part of purpose.